When we moved back in January, I lost a lot of closet space. So much that I almost cried over it, all of us have small closets, and I miss my huge walk-in closet on a daily basis. 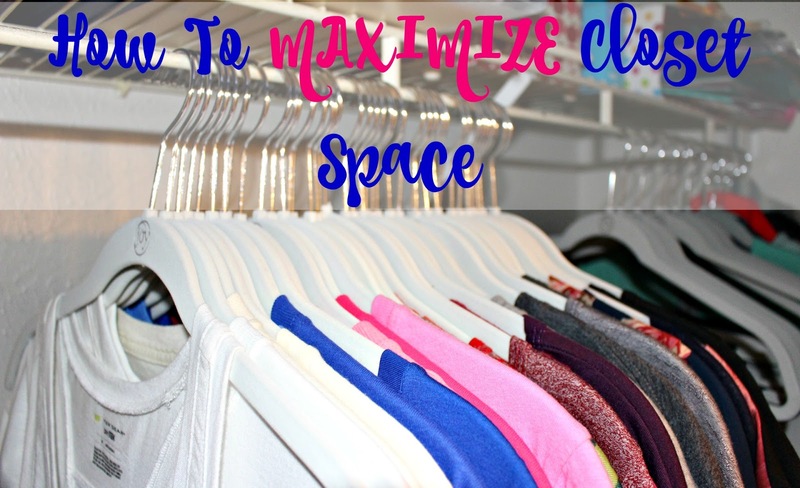 However, I quickly learned that I needed to maximize closet space for every single closet in our house and I was going to have to be creative and stick to a budget. So I searched and searched for ideas on Pinterest, then headed to my favorite store, Target. I had a few ideas but really needed to see some products in person to get a better feel of how I wanted to get started. First I tossed those big old chunky hangers that we have all owned for years, they take up way too much space, and are always getting broken. I replaced all clothes with Joy Mangano Huggable Hangers from Target. These are the best thing ever, I can't believe I didn't purchase them sooner! They were the biggest overhaul for my closet, I gained a lot more space on my racks! I also purchased two, four-tier hangers. These are great for leggings and skirts, keeps them out of my dresser and they can be hung nice and neat with out taking up extra closet space on traditional hangers. Next I sorted through and either donated or trashed clothing. Clothing pieces that have been sitting in our closets forever, untouched, unworn items, items that were faded or old, or clothing I just knew I'd never wear again. I said good-bye to it. When I re-hung all of my clothes and organized them nice and neat with the Huggable Hangers, I organized by color. I don't organize by season because in Texas, well some days you might be wearing long sleeves and the next you could be in shorts and flip flops. I start with my whites and lighter colors, then end with darker colors and blacks. I'm telling you, these hangers are amazing! I have so much extra rack space now, I might just have to go shopping! Ha! Once I'm done working on the racks, I move to the shelves. I don't have much shelf space at all, so it stays pretty free and clear minus some files and a stack of gift bags that are on the top shelf. The kids don't have shelves in their closets so that area was easy and is done. Moving on to shoes, yikes! Again, I made donate or throw away piles and than organized them by putting boots and winter shoes in the very back, sandals and flip flops in the middle and my tennis shoes up front. They are my everyday shoes and ones that get worn the most. I haven't purchased a shoe rack yet but it is on my next to-do list. I also keep a small bin in the bottom of one of my kids closets, this is great for when they outgrow a clothing item and it's time to donate or pass down to another family member. When it's full, I bag it up and haul it off. The closets here also don't have enough room for our dressers or a big laundry basket so I've had to find other places to store those. I'm always looking for new organization tips or hacks, do you have any of your own you'd like to share?